I was prepared to hate this. 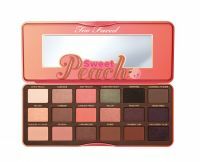 I haven't loved all Too Faced Eye products in the past, and at first glance, I wasn't sure that this palette would be wearable. Plus, how could it possibly live up to all of its hype? Boy, was I wrong. The shadows are silky, pigmented and long lasting. The range of soft brown and peachy shades are incredibly wearable. And the packaging? Adorbs. I don't even mind the peach scent (even though it feels a bit gimmicky). This is such an adorable and solid palette. I don't typically need a wide variety of shades, but these earthy hues really speak to me, and are a nice departure from what you usually find in an eye shadow palette. A peach-scented palette sounds so gimmicky, but it's got just the right amount to make it fun, not distracting. The colors, for the most part, are super-pigmented and blend nicely -- not much in the way of fallout, which is a must for me. This reminds me of something from Sanrio back in the day. I love the peach scent and the gorgeous color combinations. I felt like there was a lot of product fall out on my cheeks when I applied it which left me with oddly colored, shimmery cheeks. I like that there were so many color combinations for day and night.